My S-Type was booked into the local dealer twice to solve this problem while on holiday in Scotland - once for new replacement brake pads, then for a new replacement rear brake caliper. 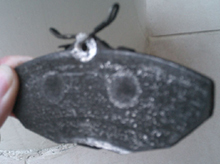 I am left with a heat damaged rear brake disc (See AA & TCS Reports) and a lack of confidence in the rear brakes. UPDATE : Rear Brakes have been replaced by Main Dealer. I asked my Dealer to check my tracking as I felt it was incorrect. They shrugged and said that an alignment check would not be covered by warranty. I duly paid for a full wheel alignment check. As noted later by the AA Engineer (See AA & TCS Reports) all 4 of my tyres had worn unevenly by 14,000 miles. I am now aware of two TSBs (See Jaguar TSBs for more Technical Service Bulletins) that discuss "revised" toe settings. TSB S204-12 Excess wear on the inner edge of the the front tyre treads. Modified toe specification. I have been informed by another S-Type owner that you must inform your Dealer within the first year to be able to have anything done under warranty. If you have an early S-Type check the insides of your front tyres.